Coconut oil has had a meteoric rise in popularity thanks to its ‘superfood’ marketing angle. One of the big claims made about its ‘heart health’ benefits has been called into question by a recent review of the scientific evidence. Coconut oil certainly is attracting a lot of attention for its many claimed health benefits. Many of the health claims though represent marketing being well advanced of the science. Coconut oil is a pin-up food to showcase the power of the Internet to propagate any food to ‘superfood’ status. 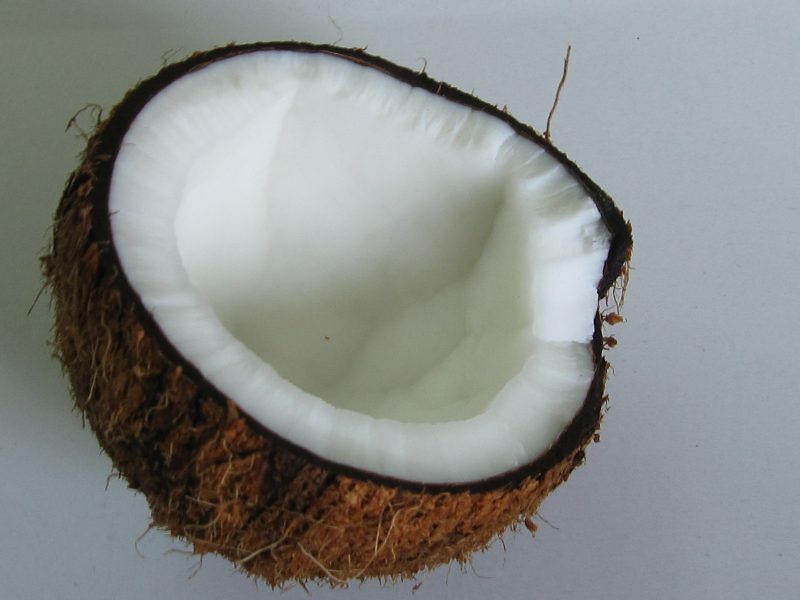 Coconut oil is very high in saturated fat, at around 90 percent. It is claimed that the type of saturated fat found in it is healthier than other types of saturated fat so it doesn’t represent a risk to cardiovascular health. Populations that use coconut oil as part of their traditional lifestyles do appear to have lower rates of heart disease. So this gives some credence to the heart-health claims. But of course, such observational studies can be heavily biased by all sorts of other lifestyle factors. There have been some clinical trials that appear to show that coconut oil may have less of an adverse effect on blood cholesterol than other types of saturated fat. But that doesn’t mean then that it is healthier than other types of oils. Looking at the observational and clinical trial evidence together, what sort of conclusions can be drawn? Combining 21 published studies, New Zealand researchers found that coconut oil did raise the less favourable LDL-cholesterol to a greater extent than other types of plant oils. Butter however was found to raise LDL-cholesterol even more. When the observational evidence was looked at, it was almost impossible to state that coconut oil was an explanation for any heart health benefits. Traditional dietary patterns and lifestyles are the main explanation for this. In such diets, coconut oil is eaten together with the fibre from the coconut along with plenty of omega-3 fats from fish. These traditional diets also are low in highly refined carbohydrates and sugar. Compare that to the popular coconut oil dessert-based dishes that abound in its promotion through social media. Coconut oil is not some miracle health elixir. On balance it should not be viewed as much different from other sources of dietary saturated fat. It has its place in cooking like any oil or fat, but it is better to consider using a variety of oils in cooking for the job at hand and the taste outcome a person wants. And for entertainment purposes, here’s the inspiration for the blog post title. Thank you for this article, and even more for the laughs. Loving your sense of humor! Great article. Coconut oil is certainly becoming more and more popular together with the acai berry and other “pin-up foods”. But hopefully, people would realize it takes more than consuming superfoods to be healthy – exercise and sleep, among others, play a huge role as well. It’s a real worry when an expert uses this LDL generalisation. Though you didn’t say the usual, PUFA lower LDL, Which is also misleading, because of the way the PUFA does it. I LOVE Coconut oil! I’m from a tropical country and our families have been using coconut oil for all 3 meals for generations. I personally use it to prepare all 3 of my meals. Food (Rice and curry mainly) cooked in coconut oil I found was much more delicious than when cooked in other oils. Apart from this I also try to have a spoon full of organic coconut oil everyday if I remember (after lunch) I also apply it on my face and body as a moisturizer. I also mix it with sugar and use it as a face and body scrub. I’m in my mid 30’s but everyone says I look as if I’m in my early 20’s. (I’m not sure if this is due to good genes though lol) I was suffering from severe dust allergies but it subsided a lot after I started consuming a spoon full of coconut oil everyday. Here rosemary stanton, and others on here…this is exactly what to test for by expert pathologist that knows the pathway mechanism to cvd. You’d all learn something here in 25mins than what you thought you knew and why. As I have said before, dr kens daughter has type 1 as well which is why he’s focused so much on this. He doesn’t mention at all how this information can be used by those with type 1 diabetes. I get annoyed when all these people on cookery shows go on about coconut oil as a healthy oil and how they use it instead of other oils and fats. Thanks for boiling it all down into an easily digestable peice of information. Yes, a voice of reason on coconut oil. Always good to look at the complete context of how it was traditionally used. Personally, I’ll take butter in my sweet treats over coconut oil any day! I was so happy to read this review from Laurence Eyles and colleagues. I’d started writing a review on crazy coconut claims – and here it is all done! So now we can enjoy some coconut occasionally and ignore the jars of unappetising thick white coconut oil on the supermarket shelf! I’m not sure id be quick to say ..”there I told you” rosemary. Dr ken sikaris, Melbourne pathologist who studies blood lipids day in day out, has a daughter with type 1 and has shown quite clearly what happens when he himself started on his own lchf journey what it can do to improve health. Triglycerides to hdl is more important than just LDL, in fact there are many different ldl. Id highly suggest you chat to dr ken about it. cholesterol and saturated fat DO NOT cause heart disease. INFLAMMATION DOES from sugars and refined carbs. Gospel is not science and was inaccurate to boot. Rob, take a look at this recent reply to Saturated Fat in BMJ, it might give you some more context and perspective on energy balance and the more important than that, help you understand that this nutrition stuff can be complex business when you’re dealing with isolation of certain macronutrients. I think the key here comes back to the overall real-world approach to doing things with regards to fat intake as opposed to inherently calling something innocuous. You’ll basically find any article to support your claims (look what I’ve just done above with the link to the paper) but the key is to take it all in context and dosage.